Intended for large bore revolver shooters with an enduring passion for performance, the Remington 240 grain .44 Magnum High Terminal Performance Soft Point truly stands alone in this regard. 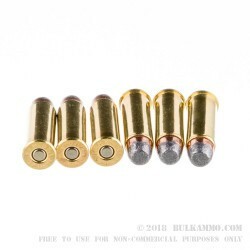 The 240gr HTP soft point bullet purposely exposes the lead core at the forward tip of the bullet in order to accelerate expansion of the hollow point cavity upon impact. At a muzzle velocity of 1,180 feet per second, the Remington 240gr .44 Magnum High Terminal Performance SP is capable of leaving a permanent cavity that is devastatingly larger than the diameter of the round itself. With a average muzzle energy of 741 foot lbs of force, the Remington 240gr .44 Magnum High Terminal Performance SP is the ideal round for large bore revolver hunters interested in hunting medium size game such as whitetail deer or boar. 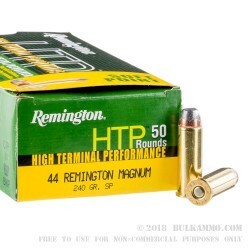 If you are in the market for a large bore revolver round that is truly effective at hunting, the Remington 240gr .44 Magnum High Terminal Performance SP is the round for you. 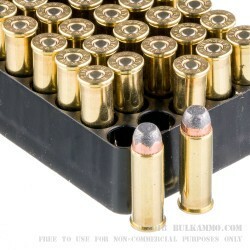 Q: What is the ballistics of this round out of a 4 inch barrel? A: Hello John! Remington lists the muzzle velocity of this round at 1180 fps with a muzzle energy of 741 ft. lbs. Unfortunately Remington does not list the barrel length of the test barrel used for this ballistics information.